Rail network operators, Queensland Rail (QR), not only need concern themselves with maintaining the rail track formation and infrastructure directly relating to their rolling stock, but often encounter complex engineering challenges within the Rail corridor. One specific challenge developed along a boundary embankment near Redbank Station, southwest of Brisbane, Queensland. The presence of highly erodible soils, regular heavy sub-tropical rainfall, and a moderately steep slope, combined to promote aggressive erosion over a 100 m long section. Compounding the erosion problem, was the location of 600 mm deep service pits at the foot of the slope to which access was being compromised by the eroded soil. Other concerns raised by QR in their request to Geofabrics for support were: their inability to schedule track closures to complete repair works and the desire to establish a catch drain at the top of the slope with workable space restricted by a boundary fence. 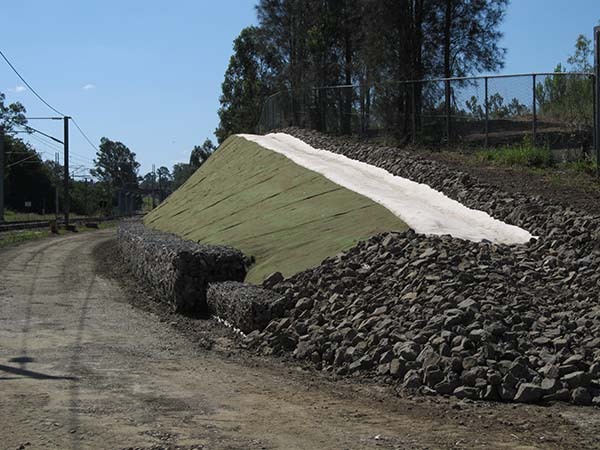 Having access to an impressive suite of systems and products from world-leading manufacturers and extensive experience as Australia’s leading geosynthetic supplier for nearly 40 years, Geofabrics developed several solutions for QR’s consideration. After clearing the bank of vegetation, a single course of Gabions, 1 m in height and width, were installed along the length of the embankment to form a permanent toe from which the slope could be re-graded. All the while insuring the underground services were protected and access to them maintained. Maccaferri Gabions have been installed at the toe of the slope, bidim has been been laid on top of the prepared soil and the install crew are preparing to install Geoweb from the top of the slope. The placement of bidim geotextile at the interface of the permeable gabions and the slope soils, prevents the fine particles from washing out through the gabions, while allowing any seeping or pore water to freely drain. A bidim layer covered the entire area of re-established slope for this same purpose, prior to installing the Geoweb system. By anchoring the Geoweb and tendons into an established trench at the top of the slope and with ATRA Anchors spaced throughout the slope face, once expanded, QR created a reinforced, three-dimensional, honeycomb, embankment surface, 150 mm deep, into which they could place any choice fill materials, including “foulled ballast”. Foulled ballast is material which has become “foulled” due to the infiltration of subgrade fines, like clay, or through the break-down of the ballast particles themselves into fines. 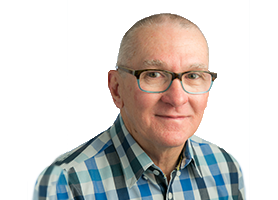 Unfortunately, this spent ballast, due to its’ contaminated classification, cannot simply be replaced and disposed of in local landfill, so it typically remains stockpiled throughout the rail corridor. And when operating 6,500 km of rail, you can be assured fouled ballast is not in short supply. The versatility of genuine Geoweb, enabled the use of this material in stabilising the embankment, a win-win from QR’s perspective. With the Geoweb secured and filled, QR elected to then cover the ballast filled geoweb with Grassroots erosion control matting. Along with its natural coloured aesthetic, high resistance to UV degradation, and capacity to dramatically lower the hydraulically induced sheer forces acting on underlying soils, Grassroots has a strong track record of proven performance with the QR engineers involved on the Redbank works. The Geoweb Cellular Containment System has been installed on the slope and filled with foulled ballast. The team now prepare to install Grassroots over the slope. Having now stabilised the slope, creation of a “V” drain at the top of the embankment commenced. Directly over the anchor trench, the drain was formed with more fouled ballast and topsoil, to capture runoff and channel it around the rebuilt slope. Once shaped the drain was lined with an innovative fabric impregnated with concrete aptly named Concrete Canvas. Included in a new class of construction materials known as Geosynthetic Cementitious Concrete Mats (GCCM), Concrete Canvas hardens once hydrated to form a durable, fibre-reinforced, concrete layer. Because the site had limited access, and the cost of poured or sprayed concrete can be inhibitive, the quick to install Concrete Canvas helped QR meet their timelines and complete the works prior to the approaching Christmas holidays.